Living room is one such area in a house that welcomes guests with open arms. So, it is obvious that a home owner wants that their living area should be appealing enough. And people, who are always on a look out for lending traditional touch to their home want that something exclusive, should be used. For this purpose, using Rajasthani style curtains is highly recommended. It is because they are dipped in conventional prints and add to the spectacular appeal to the room. An excellent thing about them is that they are printed in fast colors, which will not let the curtain lose its vivacity with a wash. Moreover, Rajasthani handlooms are exemplary of elegance, style and royalty. Even the kings and queens of Rajasthan paid high importance to their art and cultural handloom printing techniques. There are a variety of printing styles embarked on the piece of cotton that looks really magnificent. Talking about the block printing style, they are richly crafted in bright shades that look really magnificent. The fabrics are spread on table and tied at four ends. Further to this, the blocks are dipped in colors made from natural materials and pressed over the fabric for better outlook. The best part of such fabrics is that they have strength in them and make sure that every print comes out to be spectacular. Each and every step of printing the curtains makes them look appealing. They are carefully done, so that the colors do not get sprinkled around. 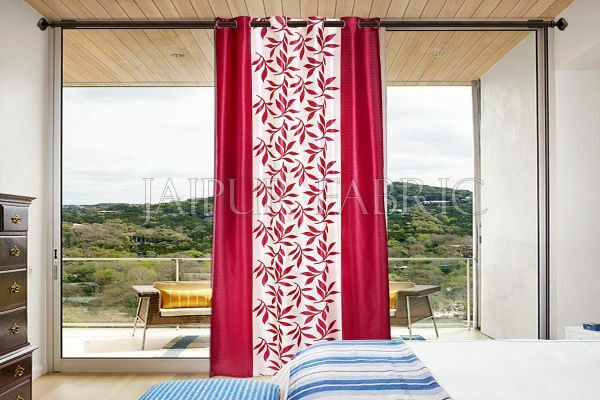 This is the reason that curtains from Jaipur are always a favorite for the people. The Rajasthani curtains have managed to gain attraction worldwide and attracted people from all corners of lives. Apart from the block printing techniques used on curtains, one can also check out floral prints adorned by stems and leaves on them. The use of curtain is done to beautify one’s home and has managed to attract people coming as visitors. For this purpose, people are always on a lookout for quality curtains over internet. In this matter, it is good to savor on the delight of Rajasthani curtains that looks simply great. It is the dream of the every individual that they should articular best interiors for their home. Rajasthani curtains surely add to the value. Some of the other prints seen on the curtains from the Royal world of Rajasthan are Rangoli style. This tends to be an intricate pattern richly printed with the help of blocks. The beauty of such a print is that it looks simply majestic and tends to beautify the entire masterpiece. Everyone is aware of the fact that curtains are meant to cover windows in style. This is the reason that people keep on searching for the online stores. By making sure that they get the right curtains, their rooms get livened. Of course, curtains happen to augment interiors to a large extent ensuring brilliant appearance.